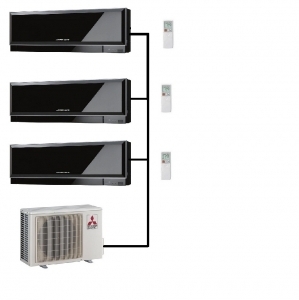 Mitsubishi Electric MXZ-4E83VA outdoor condenser units with 3 Zen high wall indoor units. This option with the MXZ-4E83VA outdoor unit has more capacity to allow larger indoor units to be partnered with the outdoor unit. The Zen indoor units from Mitsubishi are avialable in a choice of colours black, silver and white and have a range of advanced facilities such as a full weekly timer facility and better filtration. So if you suffer from allergies such as hayfever we recommend this range of indoor units compared to the standard range of indoor units.